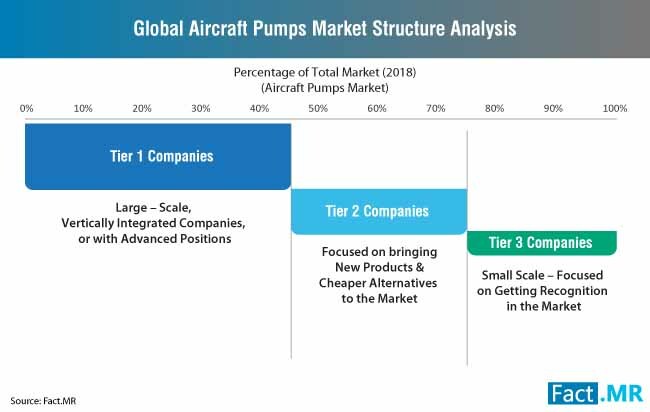 Established players continue to consolidate their position in the aircraft pumps market, accounting for approximately two-fifth share. Technologically advanced and customized product designs, along with the development of highly-efficient and lightweight aircraft pumps are key focus areas of these players, with an aim to remain compliant with regulations on emissions. On the other hand, regional and local aircraft pumps manufacturers are focusing on new product development, and cost-effective solutions to sustain their position in this highly competitive market. Some notable developments in the aircraft pumps market have been listed below. Triumph Group Inc. has recently sold its APU Repair Product Line (RPL) of Triumph Aviation Services Asia, Ltd. to TurbineAero, Inc. With this business transaction, Triumph aims at divesting its non-core business to compensate with its debts, and invest in latent opportunities. In 2018, Woodward Inc. acquired L’Orange GmbH for €700 million from Rolls-Royce’s Power systems business. Cascon has recently rolled out its Series of 300-100 pump models, to provide affordable aerospace solution for fuel and coolant pumping applications. The Civil Aviation Administration of China (CAAC) estimates consumption of jet fuels in the country to reach 40 million tons by 2020-end. 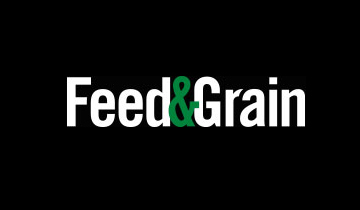 In response to environmental concerns related to jet fuel consumption, the CAAC plans on using nearly 12 million tons of biofuels in aircrafts, thereby creating opportunities for relevant component manufacturers. The report on the aircraft pumps market provides detailed profiling of key players, including Eaton Corporation plc, Honeywell International Inc., Crane Aerospace & Electronics, Parker Hannifin Corporation, Cascon Inc., Triumph Group, Inc., Crissair, Inc., Zodiac Aerospace, Weldon Pump LLC, and Woodward, Inc.
For full coverage of the competitive landscape, get in touch with our experts. Significant growth in passenger and freight air transport is driving the demand for new aircrafts, consequently increasing competition between manufacturers in terms of performance optimization and reduction in maintenance and operational cost. The International Air Transport Association (IATA) estimates the number of air travelers to close in on approximately 7.2 billion by 2035, with most of the traffic coming from Asia Pacific. IATA further projects China to overtake the US as the largest aviation market by 2024. Air travel is expected to soar exponentially in Asia, with significant increase in aircrafts imports in China. In addition, China’s state-owned Commercial Aircraft Corp. of China is planning to introduce its narrow-body jet C919, which would come into effect in 2020. As conventional aircrafts are fast being replaced with new fuel-efficient variants, aircraft pump manufacturers are increasingly focusing on developments in terms of high-pressure lightweight attributes. Jet pumps continue to witness significant adoption in aircraft fuel systems, owing to their greater reliability, and absence of moving parts, which further deprives the probability of failure. Growing customer base combined with low operating costs is likely to benefit aircraft components manufacturers and OEMs in future. Airlines are increasingly opting for lightweight pumps that can improve fuel-efficiency. Additionally, growth in air passenger traffic is leading to shorter replacement cycle, this is driving demand for aircraft pumps by Maintenance, Repair, and Overhaul (MRO) industry. Fact.MR’s study offers incisive insights on the aircraft pumps market. A summary of the report is available upon request. More Electric Aircrafts (MEA) are now being widely recognized as the future of aerospace industry, to meet increasing power demand, improving fuel economy, and reducing emission. Aircraft manufacturers are taking significant efforts to convert hydraulic and pneumatic components in airplanes to electric. This has further resulted in robust adoption of electric motor-driven aircraft pumps, owing to their easy adjustment of input shaft power, and reduced power loss from source. Sensing the shift, Aircraft component are focusing on enhancing their production capacity of electric motor driven pumps, while envisaging future evolutions in more electric aircraft technologies. The Advisory Council for Aeronautics Research has set a goal to reduce 50% carbon dioxide emission in air transportation in Europe by 2020. With the advent of more electric aircraft designs, defense aircraft integrators and users continue to focus on reduced operational cost combined with easy maintenance checks, which has further complemented the replacement of mechanical and hydraulic systems with electrical variants. Aerospace companies are increasingly investing in MEA technologies while closely working with research organizations, to develop next-generation products and aircraft components. Fixed displacement pumps are gradually being replaced by piston pumps in aircrafts, owing to their constant pressure variable displacement. Most of the aircrafts have adopted hydraulic pipe and hydraulic/fuel oil heat exchanger, which has entailed significant heat-generation challenges, especially in military aircrafts. Various investigations conducted recently have shown that pressure requirement is excessive in combat state, while other stages of flight require lower pressure to control extreme heat-generation. This has further led to the development of new pumping systems for military aircrafts. Responding to the heat generation concerns, researchers across countries such as China, America, and Britain are working on the development of intelligent pump and dual-stage pressure pump. The dual-stage pressure pump are currently being deployed in various aircrafts, as they facilitate catering to pressure-related requirements, thereby improving performance. Intelligent pressure pumps have witnessed wide adoption in aircraft hydraulic system in recent years, which has driven the demand for displacement sensors, temperature sensors, and pressure sensors. Variable pressure and flow produced by these sensor-equipped pumps, depending on the flight state change, continue to complement the penetration of intelligent pressure pumps. However, most of the sensor-based pumping systems are still in the testing stage, with promising future scope for adoption in aircrafts. The aviation sector is showing increased interest in using electricity as a power source for airplanes, owing to their cost- and energy-related benefits over gasoline. The trend of electrification is gaining momentum in the aviation industry, as leading players show a marked preference for electric motors, thereby constraining adoption of conventional aircraft pumps. 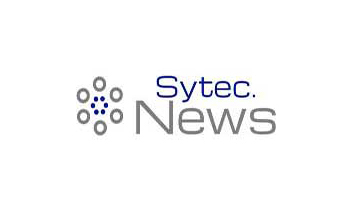 Fuel cell-based and battery-operated systems are undergoing continued advancements, in line with the focus of industry players on the developments that ebb the power consumption below 100kw. The shift of aircraft manufacturers toward battery-operated systems, in line with advancements in the lithium-ion technology will emerge as a key concern for conventional aircraft pumps manufacturers. For a detailed analysis on all the key market factors, request a sample. Aircraft pumps help to deliver jet or aviation fuel to Auxiliary Power Unit (APU) and propulsion system of the aircraft. Aircraft pumps provide continuous flow of fuel irrespective of the aircraft altitude. Types of pumps used in aircraft include fuel pump, cooling pumps, hydraulic pumps, and water pumps. These pumps can transfer various fluids such as oil, water, fuel, and others to aircraft components. The report on the aircraft pumps market offers key insights on the market along with market dynamics including latest trends, market drivers, and restraints that are expected to impact the aircraft pumps market. The report also focuses on current scenario in the market and forecast on the aircraft pumps market. The study provides in-depth analysis of the competitive landscape in the aircraft pumps market. The report highlights all the essential factors that are driving growth in the aircraft pumps market. Segment-wise and region-wise analysis of the aircraft pumps market is also provided in the report. The report focuses on key segments in the aircraft pumps market. The aircraft pumps market is segmented on the basis of type, technology, pressure, aircraft type, and end user. Key segments are divided into sub-segments. Based on the type, the aircraft pumps market is segmented into hydraulic pumps, air conditioning and cooling pumps, fuel pumps, lubrication pumps, and water and waste system pumps. By technology, the aircraft pumps market is bifurcated into ram air turbine driven, electric motor driven, air driven, and engine driven. The aircraft pumps market in terms of pressure is segmented into 10 psi to 500 psi, 500 psi to 3000 psi, 3000 psi to 5000 psi, and 5000 psi to 6500 psi. By the aircraft type, the aircraft pumps market is segmented into narrow body aircraft, wide body aircraft, turboprop, and regional jet. In terms of end user, the market segment includes aftermarket and OEM. The study on aircraft pumps market along with key insights also provides answers to some important questions on the aircraft pumps market. 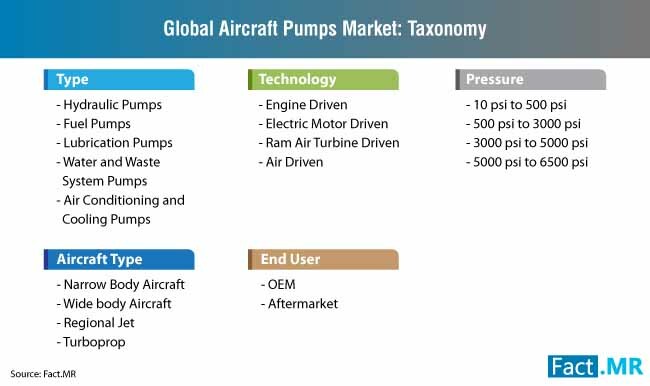 Which type of aircraft pump will account for the highest revenue share in the aircraft pumps market? What will be the value share of electric motor driven technology in the aircraft pumps market? 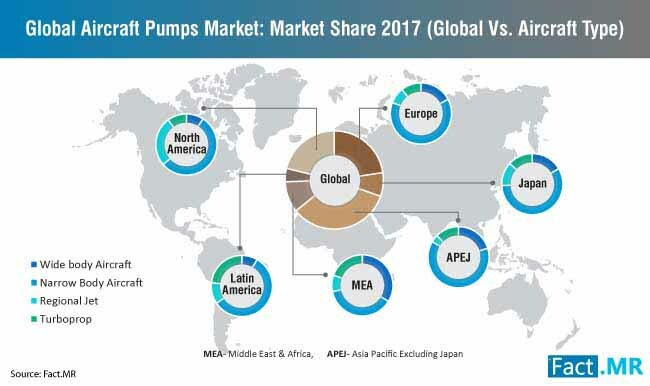 What are key market trends impacting growth in the aircraft pumps market? Which type of aircraft will account for the highest share in the aircraft pumps market? Which region will be the most lucrative in the aircraft pumps market? The report on the aircraft pumps market on the basis of extensive research methodology provides an in-depth analysis along with market share analysis. The research report has been constructed based on the information and data collected through primary and secondary research. 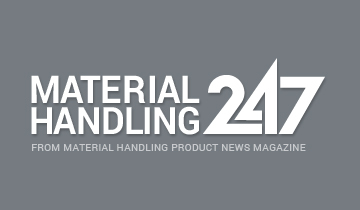 Interviews were conducted with the industry experts, manufacturers, and distributors in the aircraft pumps market. 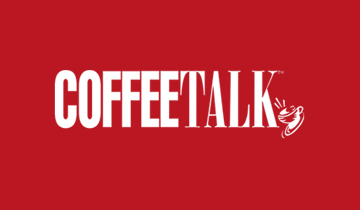 The information and data obtained during the secondary research has been validated with various data sources and insights on the market from industry experts. The research on the market was also done using top-down and bottom-up approaches. Research on the aircraft pumps market also includes details on the current scenario, historical data, and forecast on the aircraft pumps market. 1.2. Proprietary Wheel of Fortune. 2.10.18. Top 10 Airline Groups By Passenger Numbers, 2017.